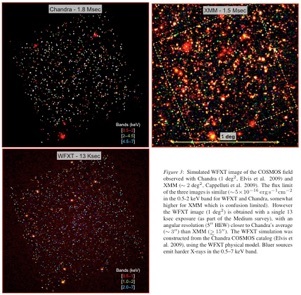 WFXT simulation of the COSMOS field, compared with Chandra and XMM [PDF] [Movie]. 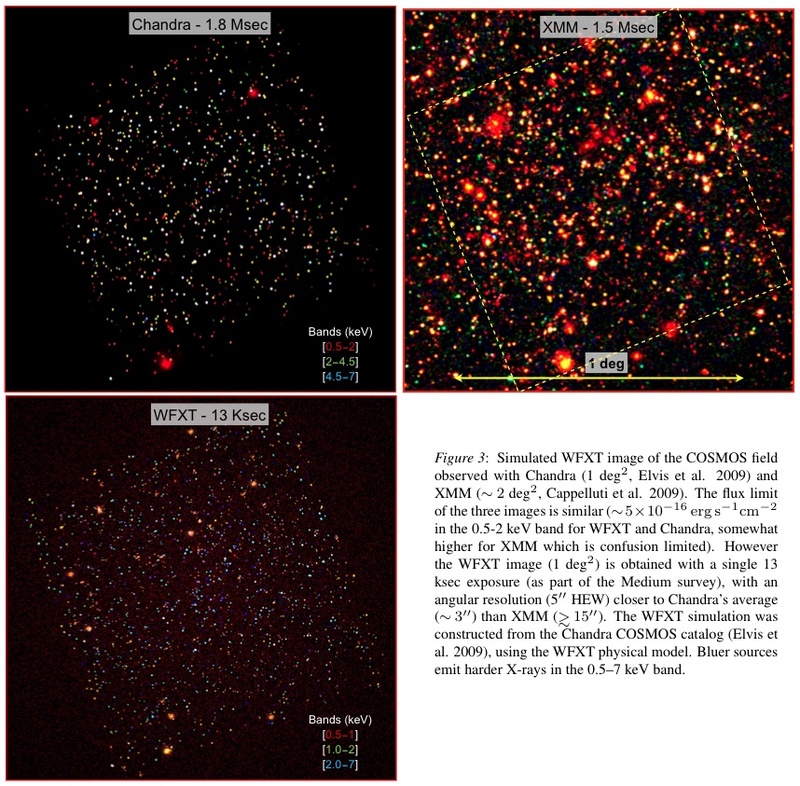 Simulated WFXT image [JPG], 1 degree on a side, from the Medium survey (13 ks) in the 0.5-7.0 keV band (red, green and blue colors denote X-rays of increasing energies). The simulation is based on the known distributions of X-ray sources (i.e., luminosity function and evolution of AGN, galaxies and clusters), a background model, the telescope model (PSF, vignetting, eﬀective area) and the detector model. 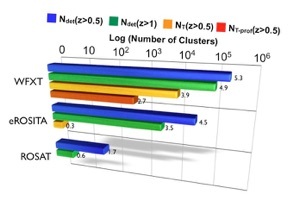 Clusters are simulated by “cloning” (i.e. 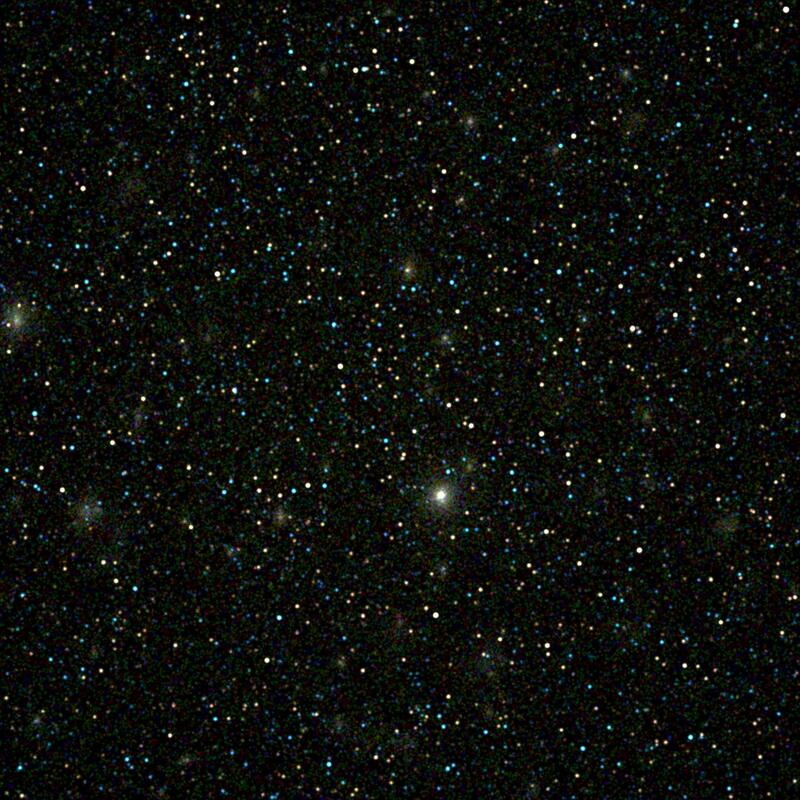 rescaling in size and flux) a representative sample of low-z clusters observed with Chandra. 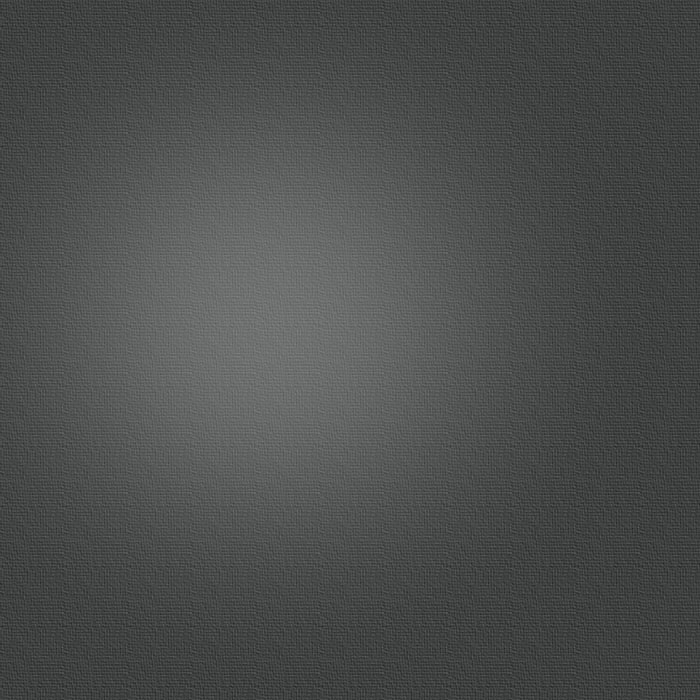 The animation below shows a 18’ sub region in the Wide, Medium and Deep surveys. The Bullet cluster (z=0.3, T=14 keV) as observed at z=0.5,1,1.5 with WFXT in the Deep (400 ks) survey [PDF]. 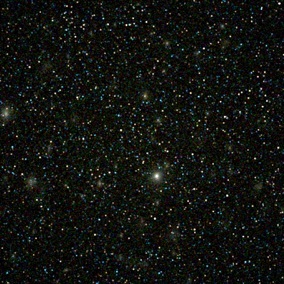 The Cluster (left) and AGN (right) discovery space for a high-sensitivity, 5-year long WFXT survey, compared with other missions (eROSITA, planned for 2013 and EXIST, proposed). 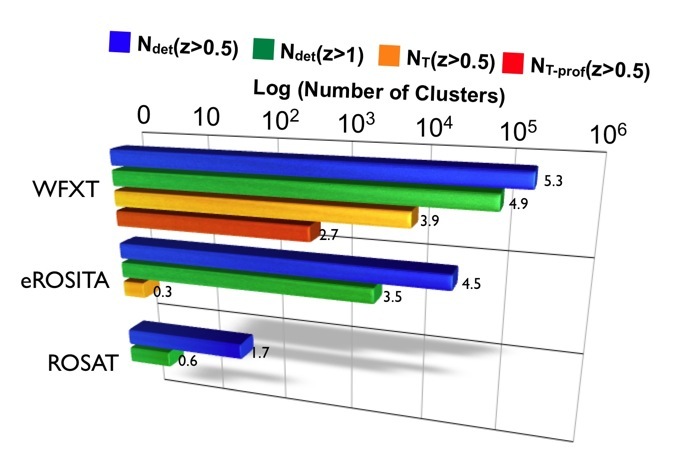 Left: bars indicate the estimated number of clusters detected at z > 0.5 and z > 1 (with >50 photon counts, blue and green respectively), number of clusters at z > 0.5 for which an accurate measurement of the temperature can be obtained (>1500 counts; orange) and those at z > 0.5 for which temperature proﬁles and ICM metallicities can be recovered (>15,000 counts; red). 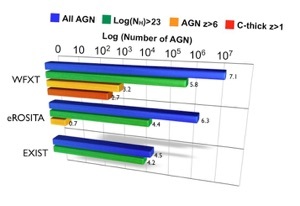 Right: estimated numbers of detected AGN: total (blue), heavily obscured (green), and objects in the early Universe (orange). 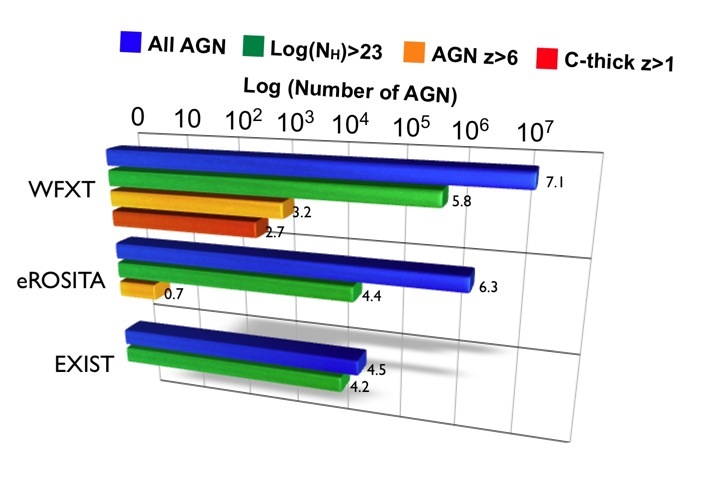 The red bar shows the number of AGN which will be unambiguously classiﬁed as Compton-thick at z > 1 based on their X-ray spectra (>400 counts). Note that a logarithmic scale is used (last update April 2010). Look-back time cone of the expected cluster sample from the Deep 100 deg2 survey. WFXT will open up a largely unexplored period in cosmic history, back to the epoch the first protoclusters form and the first structures virialized glowing in X-ray. Only WFXT clusters at z>1 are included (cyan dots). 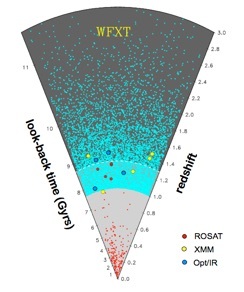 The red dots indicate clusters found in ROSAT deep surveys out z=1.3; yellow and blue dots those found with XMM/Chandra and Opt/IR surveys respectively, and spectroscopically confirmed to date.